How old is Royalty Christian Centre? We are 18 years old. We started in 1998 as a church. Before the church was born, we ran outreaches and fellowships for about two years. So that people can learn from your example, how have you overcome some of life’s challenges? I will be 46 in October and when I look back, I don’t know how I survived most of the things I have been through. I lost my dad when I was 25 and my mum died when I was 32. I lost my first wife about six years ago, so I have seen betrayal and dishonesty. One of the things that have really helped is that I trust absolutely in God. I always go back to God though His word and I always come out in a victorious manner. When I was to get married to my wife, the crisis that ensued was out of this world. It was the worst kind of noise I have ever heard in my life. I faced problems from my family and also the church. Only my friends did not give me problems. Everywhere I turned to, I was faced with criticism. Why did you choose to remarry after the death of your first wife? I was 40 when she died and this was a marriage that lasted for 13 years without a child, so my family, mentors and friends were eager to see me remarry. Initially, I never wanted to remarry and planned to adopt two children that would be cared for by a nanny. As time went on, I realised that plan was not going to work because about that time, the number of female worshippers in church was on the increase. Then, I knew that if I really wanted to play safe, I needed to remarry. How did you manage the chaos that happened when you started dating your current wife? When we lost my late wife whom everybody called mama, there was noise but it was sympathisers’ noise; but when I started dating Sunmbo, the noise changed to something else. It was horrible. Because I had a strong conviction in me that she was my wife, I did not care. People would call me almost every time to ask if I had seen what had been written about her in one magazine or newspaper. People feared that dating her and eventually getting married to her would destroy the church because worshippers had started to leave the church. While I was battling this in my heart, I stumbled on a video of Joyce Meyer and that was how I got to know that she was a single mother who was in an abusive marriage before she met and married David Meyer, who had never been married before he met her. As soon as I watched that video, an inner voice told me that the way Joyce Meyer commended her husband is the same way the world would commend me by the time I am done with Sunmbo. We have been married for three years and I don’t regret getting married to her. Most of the people who kicked against me marrying her have come back to apologise. Many people do not know that I have known Sunmbo as far back as 1998. She is a music minister and I had a brother who had a gospel rap group. She was the only girl among them. When she finished singing one fateful day, even my late wife commended her singing prowess. I never thought that we would one day get married. In fact, she was close to my late wife such that when she fell from faith during her dark days, my late wife played a major role in her restoration. Unknown to most people, her past experiences became my greatest attraction. You can hardly find a man of God who married a single mother; most men of God married a virgin. Every time, the body of Christ in Nigeria preaches 2 Corithians 5:17 but do not believe it. 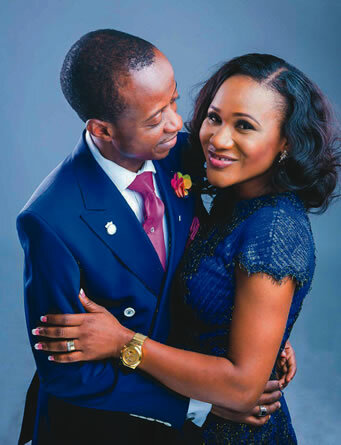 I saw people run away from me because they felt I had embarked on a risky journey when I started dating Sunmbo. Apart from ministering, what are your other interests? I like to play table tennis, I like watching movies with my family. I am beginning to enjoy travelling and I love music. I like corporate wear. I like to dress in a simple manner and unlike my wife, I do not like too many colours but I try to wear incorporate colours into what I wear. One of the things marriage does to you is change you and I have had to embrace colours in my dressing.